Key Difference: USB 3.0 is much faster than USB 2.0. USB 2.0 offers a top speed of 480 Mbps, while USB 3.0 offers transfer rates of 4.8 Gbps. Also, USB 2.0 is usually grey or black, while USB 3.0 is usually blue to differentiate it from 2.0. USB is very useful tool. Chances are even if you don’t know what it is exactly or how it works, you’ve probably heard of it; and even if you haven’t, you’ve still probably used it without realizing it. The primary purpose of USB, which stands for Universal Serial Bus (USB), is communication. Basically, it is used to communicate information, data, and evern electricity between devices. In the 90s, as computer technology really started taking, so did the number of devices that were launched and used. These devices used various difference forms of wires and ports to connect to the computer. USB came about as a universal way for devices to connect and communiate to the computer. Even now, just imagine the various different devices that are connected to your computer. This primarily includes the mouse and keyboard, but may also include a camera, a printer, an eternal hard drive, etc. If they are wired, then they are using the USB. USB is also used to charge your phone, as well as to copy and transfer data from your phone, external hard drive, etc. USB is one of the most commonly used communication protocols today. It was originally released in January 1996, and was developed by a consortium of Compaq, DEC, IBM, Intel, Microsoft, NEC, and Nortel. The idea was to develop a universal communication protocol to replace the various different connectors used by the different companies; and they succeeded. 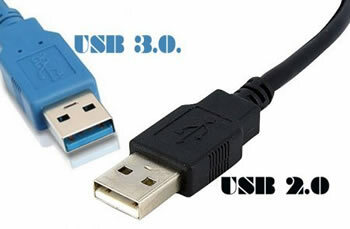 USB 2.0, an improved version, with a faster speed was released in April 2000, and was later followed by USB 3.0 in November 2008. Other than the fact that USB 2.0 is an older version of 3.0, the main differences between them is the speed. USB offers a top speed of 480 Mbps, while USB 3.0 offers transfer rates up to 4.8 Gbps. This is a difference of 10 times. However, in reality the speed of each will differ on the types of devices in use. USB 2.0 and 3.0 are also backward compatible, which means one can plug a USB 2.0 wire in a USB 3.0 port, or vice versa. However, this will also affect the speed of data transfer. The increase in the data speed is due to the fact that USB 3.0 has more wires; this allows it to carry more data, hence effectively reducing the time taken to transfer the entire data. USB 2.0 has 4 internal wires in its cable, while USB 3.0 has 9, which is more than double. The two versions of USB also differ in the way they transfer data. USB 2.0 uses the half duplex method to transfer data. This means that the flow of data in USB 2.0 is unidirectional, i.e. one can either send the data or receive the data; they cannot do both. On the other hand, the flow of data in USB 3.0 is bi-directional, as it uses the full-duplex method to transfer data. This allows the user to both send and receive the data simultaneously. Another difference between USB 2.0 and 3.0 is visual. While the port of USB 2.0 is primarily black or grey, the port of USB 3.0 is blue. This is mainly so that people are able to tell the difference at first glance by looking at the port, which looks identical. Also the male port of USB 2.0 and 3.0 differ. The port of USB 2.0 has 4 copper pins, whereas the port of USB 3.0 has 9 copper pins in correspondence to its 9 wires. The pins are in placed in two different rows, one with 4, and the other with 5. 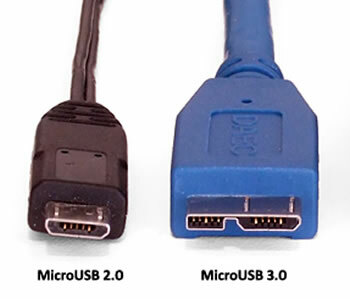 It should also be noted that both USB 2.0 and 3.0 have various different ports: Type A ports that are primarily for use in computers and large devices; Type B ports, which are mini and hence for use in smaller devices such as digital cameras, MP3 players, old smartphones, etc. However, most mini-B ports are now replaced with micro-USB ports. These are the one we see in most smartphones. In 2014, USB 3.1 was released as an upgrade to USB 3.0. It works in the same manner and principal as USB 3.0, but improves on the speed. Yet, it is not that widespread in use. However, the latest craze is the USB Type C, which it seems may eventually be more popular than USB 3.0. Type C has an interchangeable port, which means that both ends are the same. Still, it remains to be seen if it will reach the popularity and wide-spread usage of USB 2.0. Nearly always blue to differentiate it from USB 2.0.